Anytime you do that, you're going to win. Even if you turn the ball over 18 times. Good win. Great sign. And I like the fact that we got 31pts off the bench. BTW, Bonzi is a beast on the boards. I've always been impressed by that. 15 (7 offensive) boards in 27min. Yao's 8 offensive boards are amazing too. Okay, great game by the Rockets tonight. Last night were in Dallas. Had they been in our building we'd have won like we did tonight against the Spurs. Going from there, I think it's imperitave we win the west and assure ourselves of homecourt advantage. Another great thing is Mike James sucked balls tonight, but Adelman minimized the damage by limiting him to 20 minutes. Rafer came in, got the ball to Yao where he wanted it and Yao was able to score. It aint Rocket science. I think the best approach to use with James is to insert him when Rafer is tired (almost never) or when we need a scoring punch. However, if, like tonight, he is not on and shooting at the rest of the team's expense, Adelman needs to do just like he did tonight and get him the hell out, since James only contributes by scoring. He is not a player like Wells who can contribute even when not scoring. BTW 15 rbs from a 2 guard? Jesus. Glad he isn't fat and whining this year. He owns the Spurs for some reason. The ONE game I didn't watch. I knew it. Is there a place I can stream or download this game? man, i just got home after going to rockets game, thanks to red. i had to take more medicine being out this late. man, that was a great game. watching on tv don't do any justice. fans are cheering during the whole game, especially after the rockets take a good lead and the spurs call timeout. i guess on tv all you see is commercials. the game started a little slow. duncan elbowed hayes above the eye and he had to go to the locker room to get stitches. it was accident by duncan. mcgrady played good in the 1st half, but the spurs were defending him really good and at least mcgrady didn't force to many shots. 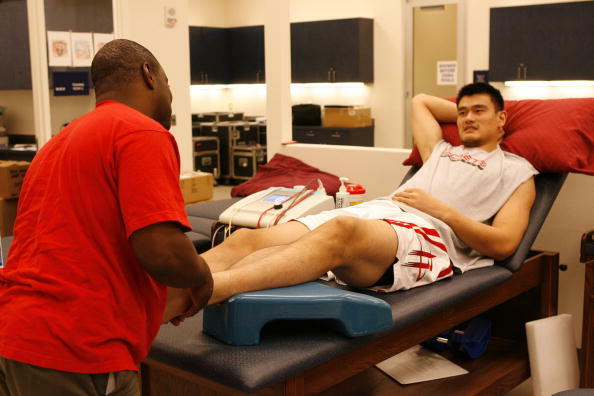 yao dunked a lot in this game, most i think i ever saw. mutombo had the crowd in a roar when he drove and dunk it on the spurs. crowd went crazy. rafer. the rockets won so i am not going to insult rafer. lets just say that the fans at the game were making a gasping noise all together anytime rafer shot the ball. james came in an provided instant offense. he shot more than he should have but any time we needed to score, james hit the shots. but the fans want francis to be point guard, and james shoot guard. ra gave some time to luther, but he makes bad decisions and passes poorly. spurs duncan, ginobili, and oberto are constantly talking to the refs to get some favor. anytime yao touched oberto he act like he get shot in the head. 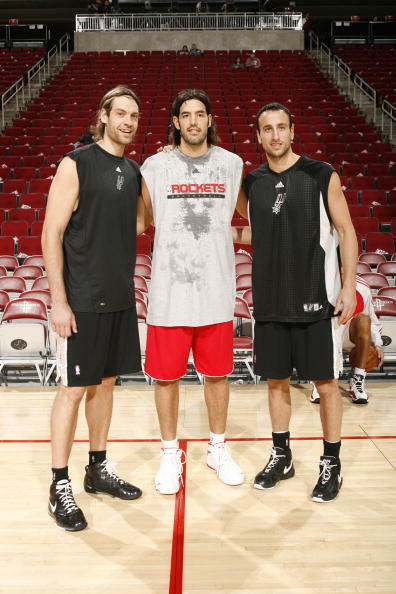 ginobili was very aggressive to the basket, only 1 time i thought it was a bad call on scola stealing the ball from ginobili on a rebound and they call scola for a foul. yao even went to protest to the refs on scolas behalf, but ref didn't want to listen to yao. mcgrady had enough and said a cuss word to the refs and the refs gave him a technical. but after that the refs started calling the game more fairly. yao played well, lots of dunks and offensive rebounds. some reason yao has trouble holding on to ball. lots of turnovers. i believe battier shot nothing but 3's, but i believe he only missed 1. he good defender and blocks out so other rockets can get rebound. player of game has to be bonzi. man, bonzi was getting all of the rebounds. 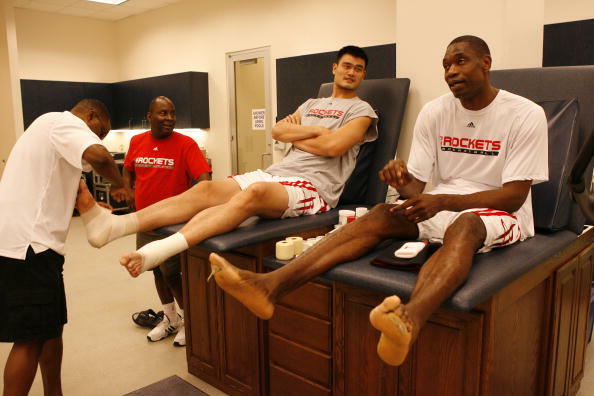 yao got a lot of rebounds to but bonzi stood out because he is so much shorter. bonzi got a lot of offensive rebounds and put backs for easy 2. no question he is most comfortable in ra's system. now the red rowdies, the seat that red let me sit in is close to the red rowdies. man, they are a fun group. they make cheers during the whole game, even when the game is a little boring. 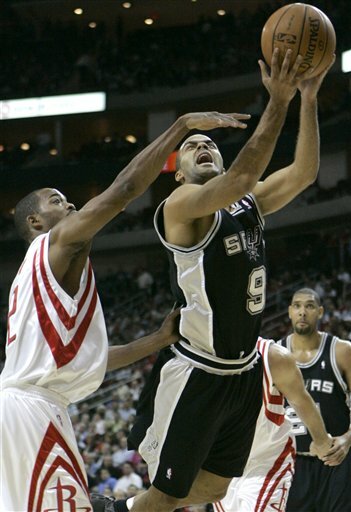 when a spur goes to free throw line, they make funny chants like manu! flopper! manu flopper! very funny chant. they also made a chant about his bald spot on head. they made a chant about duncan to, something about him and the ref that kicked him out of the game last year. believe me it was funny. ok, to tired now, go asleep. 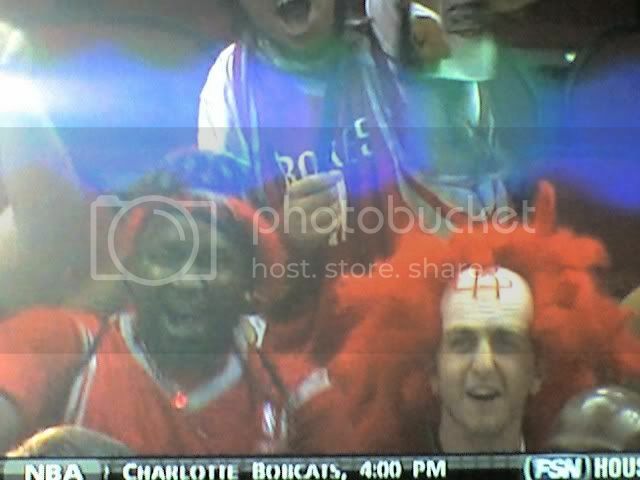 man i saw this guy at the game, i thought it was jvg at first, but not. I saw the same thing and was going to do a screen capture because it was so funny! Thanks for posting that pic!